Yiching Song obtained her PhD in rural sociology and rural development at Wageningen University in 1998 and has held her current post at CAS since 2000. 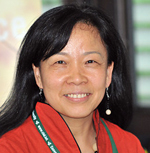 She is also a professor at China Agricultural University, Guangxi University and Jilin Agricultural University and a visiting scholar at Wageningen University. Her research focuses on sustainable agriculture, food security and rural development policies in China. Song has also acted as a key gender consultant for IFAD since 2000.